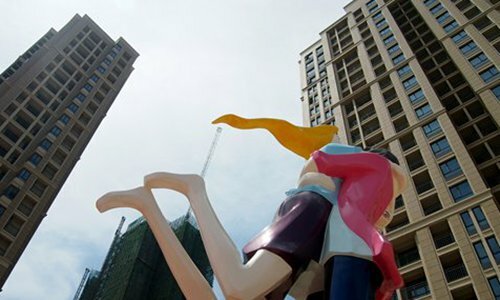 High housing prices and urbanization are among the reasons for China's declining marriage rate, which touched a five-year low last year, an analyst said. China's marriage rate fell for five years in a row starting in 2013, official figures showed. The marriage rate was 9.9 marriages per 1000 people in 2013, 9.6 marriages per 1000 people in 2014, and 7.2 marriages per 1000 people in 2018, the lowest since 2013. A negative correlation between the marriage rate and the level of economic development has been seen in recent years, Liu Yuanju, a research fellow at the Shanghai Institute of Finance and Law, said in a commentary in the Beijing News on Thursday. According to Liu, people in developed cities are less willing to get married because of unaffordable housing prices and extended years spent in education. The average monthly salary of university graduates was 4,317 yuan ($646) in 2017, which was far below the monthly mortgage payments in many cities. A typical monthly mortgage payment on a 2-million-yuan home in a second-tier city can reach 7,000 yuan. "Chinese mothers won't let their daughters marry guys without apartments," Liu said in the article, "and the mothers' requirements are reasonable, because apartments come with a series of rights, including education rights for children." "Houses are important for Chinese marriages, but they are mostly unaffordable for young people," Liu added. Another reason behind the falling marriage rate is that the marriageable population accounts for a declining percentage of the total. Liu said that the low marriage rate is a normal result of the shift in China's population structure, economic development and urbanization, but he said that measures are needed to encourage young people to marry and have children.